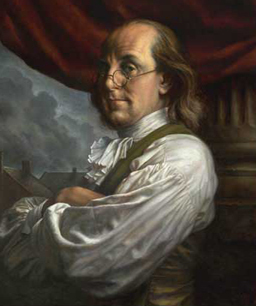 Here are thirteen moral virtues listed by Benjamin Franklin in his autobiography. Just by striving toward this level of excellence, you will not only benefit yourself personally, but everything and everyone else you are connected to will feel it and benefit as well. 6. Industry. Lose no time. Be always employed in something useful. Cut off all unnecessary actions. 8. Justice. Wrong no one by doing injuries or omitting the benefits that are your duty. 11. Tranquillity. Be not disturbed at triviality, or at accidents, common or unavoidable. 12. Chastity. Rarely use venery [sexual indulgence] but for health or offspring; never to dullness, weakness, or the injury of your own or another’s peace or reputation. 13. Humility. Imitate Jesus and Socrates (and other great minds).